The Queen and The Duke of Edinburgh welcomed the President of the Republic of Colombia and Mrs. Santos at the beginning of the President's State Visit to the United Kingdom. For more: Youtube video, Zimbio gallery. This is one of those times when I would love to be privy to the reasons behind a particular brooch selection, because rubies - the Ruby and Gold Flower Brooch, which has no known connection to these guests - are the last thing I would have paired with this outfit. They're not really that noticeable, I guess. 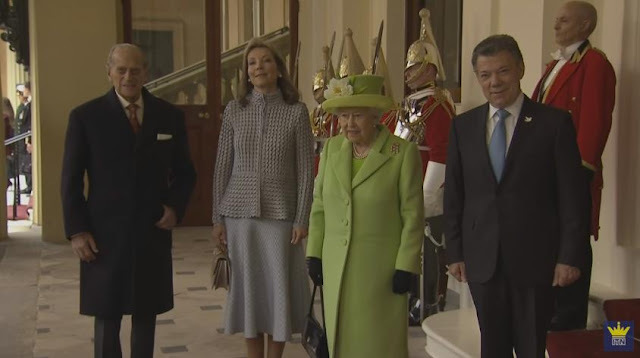 Usually, The Queen just takes off her coat once inside with her guests (and, later, inspecting the state banquet setup), but by the time they reviewed the special Royal Collection exhibit with their Colombian guests, she had a total outfit change. She went ahead and leaned into the ruby theme with the Grima Ruby Brooch. This Prince of Wales Feathers Brooch is one we haven't had a chance to cover here yet (it comes from Queen Alexandra), but it's a perfect match for her deep green outfit. A winner, and paired with her favorite pearl pendant earrings and her usual assortment of bracelets. 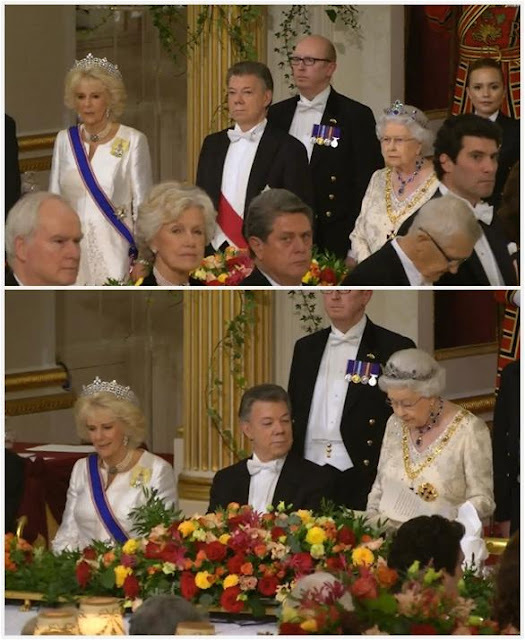 She did receive a pair of emerald earrings when she and The Prince of Wales visited Colombia a couple years ago, but these were on display with the rest of exhibits, so sadly weren't worn. The Queen, along with other members of the Royal Family, gave a State Banquet at Buckingham Palace in the President's honor. We haven't seen a tiara event in a while, and I can't tell you how delighted I am that it's one of the colored stone options instead of one of the usual favorites! 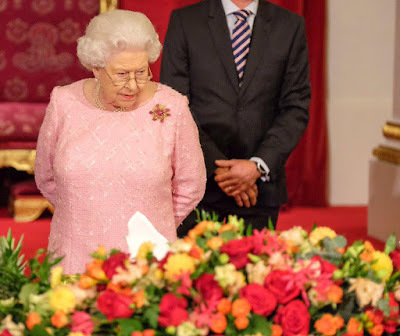 Her Maj's been dipping into those more often in the past couple years (she wore this one just last year for the China state banquet), and I love the variety. Her sapphire parure also picks up very nicely on the blue in the Order of Boyaca from Colombia, so that's well played. Besides, we've always got Camilla to hold down the white stone fort. Is it just me, or all these Greville Tiara + White Dress + Pearl Choker appearances starting to blend together? With the exception of the earrings, this is the same dress and jewels we saw at this year's State Opening of Parliament, which is the same as the State Opening the year before that. I mean, it suits her well, but I do like to complain. UPDATE: We now have video of The Queen's speech - observe her sparkly dress! 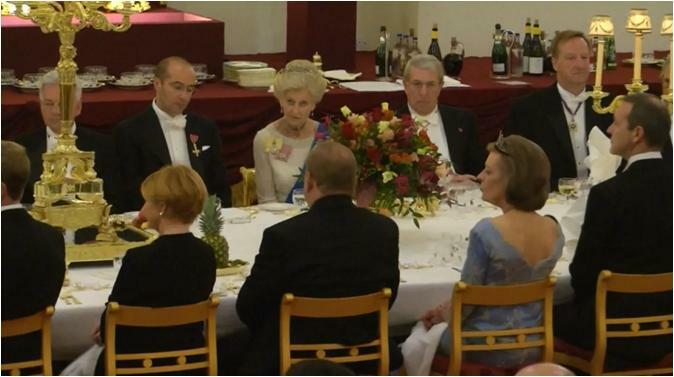 Princess Alexandra of Kent wore the Ogilvy Tiara in its pearl setting. She wears the sash of the Order of the Garter. 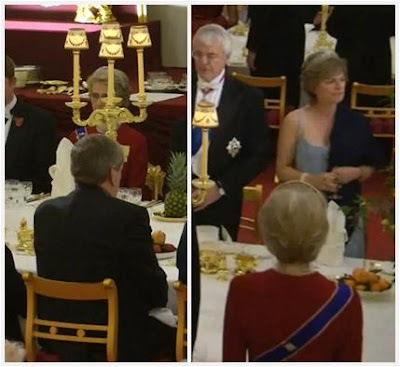 I wish we had a better look at The Duchess of Gloucester, in the red dress, because she wore the Iveagh Tiara and we don't get to see that in use often. She's wearing the sash of the Royal Victorian Order.